There’s a good reason that most of your favorite cartoon characters wear the same outfit everyday: Changing their wardrobe is tantamount to drawing and animating a completely new character. To put a new shirt on Homer or a vest on Lisa, the templates used by The Simpsons’ many, many artists must be amended. It’s a temporary change, but it takes a lot of time to make it—and in a time-consuming, visually driven medium like animation, you better make damn sure even the most incremental change leaves some sort of impact. That’s especially true of an episode like “Team Homer,” in which clothes catalyzes one storyline and serve as a turning point in another. If Mr. Burns reaches into that cardboard box and pulls out a garment with no sense of panache, the Pin Pals’ Cinderella story goes kerflooey. Instead, he produces one of the boldest items in the Simpsons iconography, a memorable visual cue that was so perfectly timed with contemporary tastes for mid-century kitsch that it would later turn up as a joke in an episode that’s partially a satire of contemporary tastes for mid-century kitsch. The color and the piping, it’s all perfect. Especially the logo, which is fun in a “vintage sports mascot” way but also looks like Burns is threatening to remove his teamates’ heads and attach them to bowling pins. In some ways, “Team Homer” is those bowling shirts. Kept alive in the pop-culture conversation by action figures and wearable replicas, the Pin Pal jerseys make it easy to overestimate how much the Pin Pals actually factor in to “Team Homer.” I went into this re-watch with fonder memories of Homer’s exploits at the Bowlarama, but it’s not the series-best storyline that I recall—but it is a decent framework, on which Mike Scully’s script hangs entertaining sports-movie riffs, solid emotional arcs, and a celebration of the supporting players who call Springfield home. It couldn’t carry a whole episode, but neither could the saga of Springfield Elementary’s new dress code. Combine them like the elements of a snappy ensemble from the designers at Mr. Boy (and Mr. Boy For Girls), however, and these two halves make a satisfying whole. The clothes don’t make the well-behaved student body in “Team Homer,” but they do form a neat little bridge between the happenings at the school and the bowling alley. It’s a question of context, similar to Milhouse’s misinterpretation of those Spiro Agnew jokes in the MAD Magazine Special Edition: The uniform isn’t inherently good, but it isn’t inherently bad, either. In Principal Skinner’s hands, matching outfits are the source of conflict; to the bowlers, it’s an honor and a privilege to wear the same shirt. The jerseys represent something that’s greater than any one person, a common goal everyone’s working toward, rather than one that was handed down from above. That’s a potent message embedded in a work that requires input from dozens of people: Express your individuality, but still recognize what can be achieved through a group effort. At the risk of getting increasingly philosophical about an episode in which a doped-up Mr. Burns mistakes Homer for the Pillsbury Doughboy: “Team Homer” is all about giving its characters a sense of purpose and belonging. The members of the Pin Pals stand out from their competitors because they’d otherwise have no group to call their own. For one episode, it’s not enough for Homer to belong to Team Simpson, and his desperation to avoid his family is the one false note “Team Homer” strikes. (But considering the jagged edge the show acquired during Mike Scully’s tenure as showrunner, it’s not a completely out-of-character moment.) Only Apu could feasibly fit in with one of the other teams in the league, but The Stereotypes aren’t defined by any true sense of identity. That’s why they’re stereotypes. 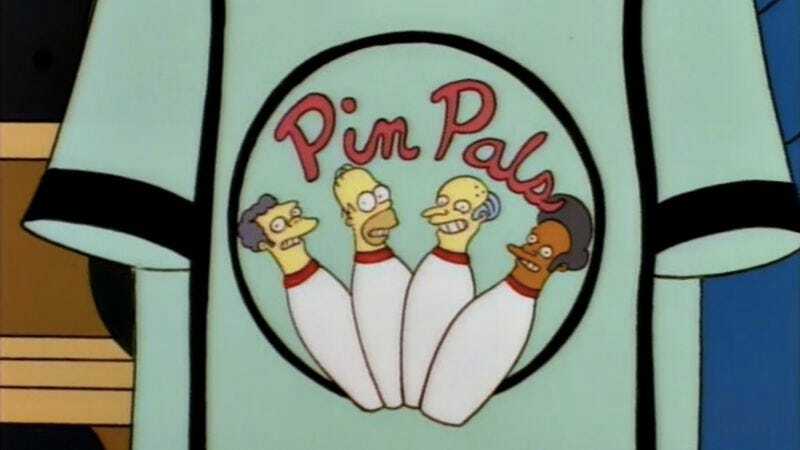 A good deal of the fun in “Team Homer” is wrapped up in the other teams in the Pin Pals’ league. It speaks to the richness and vastness of The Simpsons’ universe: Law, order, religion, and the media are all represented, and there’s still room for a team composed entirely of characters that failed to split up Marge and Homer. (Jacques is clearly The Home Wreckers’ anchor, but I have to think Lurleen Lumpkin has spent her fair share of time at the bowling alley, too.) This helps a lot in a gag-driven episode like “Team Homer,” which makes up for a lack of narrative verve by cycling characters in and out at a breakneck pace, making it a showcase for the likes of Hans Moleman, Snake, and Lunchlady Doris. The first episode to air after Doris Grau’s death, “Team Homer” is dedicated to the script supervisor-turned-castmember’s memory—fitting, as it’s an episode that also provides her primary character with a bit of biography, revealing her to be The Squeaky Voiced Teen’s mother. The sports-movie structure helps things along, too: Knowing how these types of stories typically play out on the big screen, the episode can take some shortcuts and play the Pin Pals’ rise through the ranks as a series of triumphant montages. In between the victories, director Mark Kirkland ups the kinetic energy by indulging in some cartoon physics (physics that are more cartoonish than we usually see on The Simpsons, at least). I love Snake’s escape down the lane, the camera movement and Hank Azaria’s line reading picking up speed as Snake tiptoes his way to freedom. Clothes have a lot of power in “Team Homer,” but they do a poor job of covering up a character’s true nature. The only criminal in Springfield isn’t suddenly going to play nice with the cops because they’re shirt buddies. Same goes for Mr. Burns, who has one of his “trademark changes of heart” after the Pin Pals notch the championship. (But only after a little Caddyshack assistance from true Pin Pal Otto.) 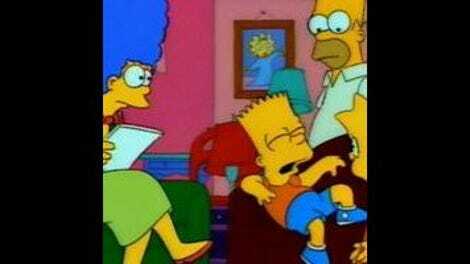 That’s a lesson that Seymour Skinner learns too late as well—but at least he got to see the neat work The Simpsons artists did on the bleeding, psychedelic colors of the kids’ uniforms! There are only two people on staff at the power plant that Mr. Burns could’ve mistaken for Poppin’ Fresh, and one of them is named Pops Freshenmeier. Next week: Rowan Kaiser meets “Two Bad Neighbors” and a thousand points of light.